Storm in a Teacup are excited to announce our involvement in the first ever Women of the World Festival at the Southbank Centre. A three day festival from 11th-13th of March celebrating the 100 year anniversary of International Womens Day. CONTRIBUTE! We will also be working on an ongoing zine project over the weekend to create the very first Women of the World zine. Bring your contributions along or help us on the production line as we create and produce a very special zine over the weekend. You will need a Saturday or Sunday conference ticket to come along and visit the Storm in a Teacup area where we will be leading some zine making workshops, initiating some networking opportunities plus lots more guests to be announced in our March update! Issue #2 SIATC Zine | Now Available ! 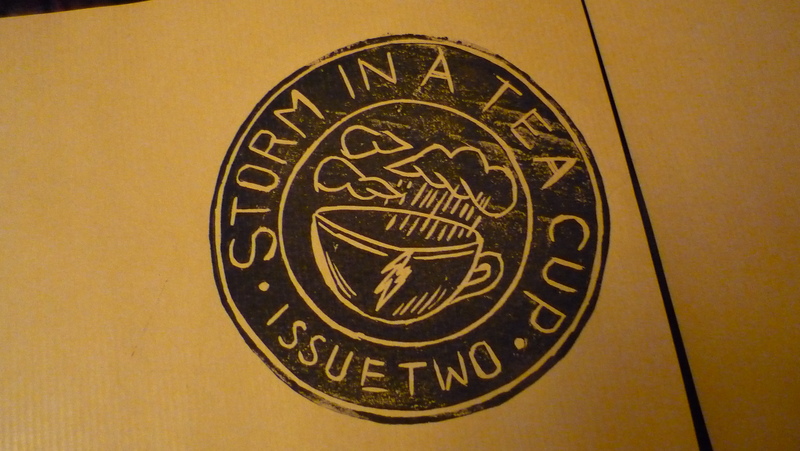 After the SOLD OUT first edition, we are proud to announce the arrival of the latest edition of the Storm in a Teacup zine. Inspired by our DIY feminist predecessors, the zine was set up because we wanted to write about amazing women who write, draw, make music and inspire us. We wanted to create something for women to read that wasn’t based around the exploitation of insecurities and the selling of products. This edition was hand made with hand printed covers and features short stories, poetry, photography and artwork as well as an update on the work of Storm in a Teacup. Plus listings, recipes and more… And all for £1.50! The zine will be available at zine fairs, including the Brighton Zine fair, this Sunday 20th Feb! We will soon be recruiting people to work with us in making subsequent editions of the zine so if you are arty, crafty, love writing and fancy getting involved, please get in touch at the above email address. We’d love to hear from you! Our wonderful friends at YARNfest short story and storytelling festival have invited Verity Flecknell from SIATC collective to perform at their finale event sponsored by publisher Picador. Join us in a smoky underbelly of the Queen of Hoxton to launch Stuart Evers new book a collection ‘Ten Stories about Smoking’. See the collection of short stories interpreted into film, theatre, music and spoken word by artists including The Strumpettes, Quattro Formaggio, Verity Flecknell (SIATC), The Android Angel and Camila Fiori. Ellie Green from SIATC has some exciting news to share…. Myself and Bex Massey (www.bexmassey.com) have just launched a new female fine art specific collective. 3.Create exhibition reviews, zines, hype. That’s lots of ways to get involved…free members forum, promotion to your sites and work, subscribe to mailing list…the list goes on. Brief: In the run up to International Women’s Day (8th March 2011) VV have decided the time is ripe to showcase some fantastic emerging female talent on our blog. We are calling all female artists to produce a piece of work based upon what International Women’s Day means to you. Simply mail it to VV (wearevv@gmail.com) with International Women’s Day in the subject line. Include a brief summary (max 300words) about your practice and a website where applicable. Deadline for submissions: Get your work to us by the 1st March and we will showcase a selection of work on our blog on the 8th to mark the day!